Is the world going down the tubes? Are the dark forces taking over? The planet earth is in the midst of an evolution in consciousness. The craziness of current events is just a reflection of the dissolution of the Old Order. How this is occuring is the subject of this movie. The old system based on unworthiness, scarcity, guile, contention, and control is going away, and so we are experiencing some turmoil. The good news is that an evolution in human thought is driving the process. Millions and millions of us are asking for more cooperation, harmony, and abundance for all. Behind the scenes, this is having a tremendous effect on the parameters of permissable action. 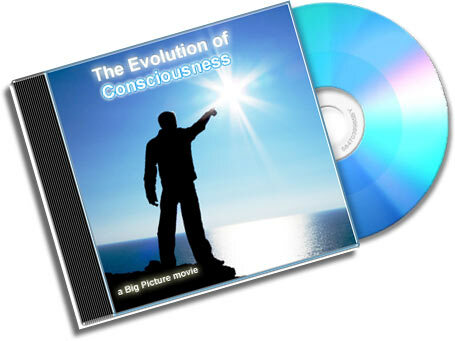 The Evolution of Consciousness explains how the evolution of human consciousness is creating a new paradigm of thought that is driving the Old Order out of hiding and into the open, and setting up the potentials for a true golden age. Note: The movie is a Flash movie that will play on your computer. $12.95 32 MB Download. A high-speed internet connection is recommended! All transactions occur on secure servers. *Google Checkout sends me your order via email that I manually process. I then send you an instant download link. Therefore, there may be a delay between the time you place your order and when your order is processed. Note: Google does NOT charge your credit card when your order is placed. Your card is not charged until your order is shipped.